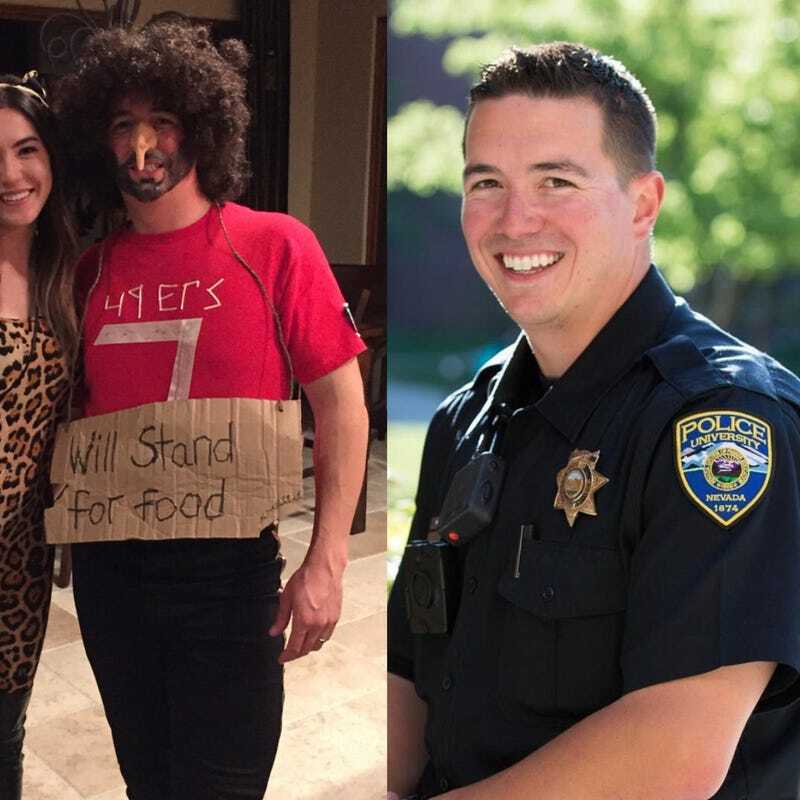 A police officer at the alma mater of Colin Kaepernick donned a Halloween costume that mocked the former San Francisco 49ers quarterback for his silent protests of racial injustice and the police shootings of unarmed black men. After pictures of the offensive costume circulated on campus as well as social media, the university police chief issued a formal apology. That officer is on leave, and an investigation is pending. For those who have seen the Halloween costume of one of our officers apparently mocking a citizen who has chosen to take advantage of his constitutional right to protest, I offer my sincere apologies. Members of our profession are held to a higher standard and denigrating another—on or off duty—is insensitive for its lack of respect and lack of understanding on how others may negatively view their actions and may be impacted. I have heard from many members of our community over the past few weeks that they feel unsafe on campus because of our current social and political climate. Behavior such as this magnifies unsafe feelings and lack of trust in police, especially when that individual is responsible for the safety of all members of the University, regardless of color, ethnicity, sexual orientation or religion. At a time when officers should be heightened in their attentiveness to perception by our community, this act seems extremely out of touch with those sentiments and reflects poorly on all of us. To regain the trust of our students, and in particular those of color, will be a challenge and will be a priority through continued education, training and conversation. The university did not provide the officer’s name or verify whether he had been correctly identified in the tweet; a university spokeswoman also said that no action would be taken against the officer. “As insensitive and inappropriate as this is, we have no policy that would dictate disciplinary action,” Kerri Garcia said. So just like regular police, this university police officer can cause harm to black people and still get away with it.